Another Win for the Good Guys! Gordon & Rees Succeeds in Overturning Yet Another Medicaid Contract Termination! Getting placed on prepayment review is normally a death sentence for most health care providers. However, our health care team here at Gordon Rees has been successful at overturning the consequences of prepayment review. Special Counsel, Robert Shaw, and team recently won another case for a health care provider, we will call her Provider A. She had been placed on prepayment review for 17 months, informed that her accuracy ratings were all in the single digits, and had her Medicaid contract terminated. We got her termination overturned!! Provider A is still in business! (The first thing we did was request the judge to immediately remove her off prepayment review; thereby releasing some funds to her during litigation. The state is only allowed to maintain a provider on prepayment review for 12 months). Being placed on prepayment review results in the immediate withhold of all Medicaid reimbursements pending the Department of Health and Human Services’ (DHHS) contracted entity’s review of all submitted claims and its determination that the claims meet criteria for all rules and regulations. In Provider A’s situation, the Carolinas Center for Medical Excellence (CCME) conducted her prepayment review. Throughout the prepayment process, CCME found Provider A almost wholly noncompliant. Her monthly accuracy ratings were 1.5%, 7%, and 3%. In order to get off prepayment review, a provider must demonstrate 70% accuracy ratings for 3 consecutive months. Obviously, according to CCME, Provider A was not even close. We reviewed the same records that CCME reviewed and came to a much different conclusion. Not only did we believe that Provider A met the 70% accuracy ratings for 3 consecutive months, we opined that the records were well over 70% accurate. 1. Provider A serves two double amputees. The independent assessments state that the pateint needs help in putting on and taking off shoes. CCME found that there was no indication on the service note that the in-home aide put on or took off the patients’ shoes, so CCME found the dates of service (DOS) noncompliant. But the consumers were double amputees! They did not require shoes! 2. Provider A has a number of consumers who require 6 days of services per week based on the independent assessments. However, many of the consumers do not wish for an in-home aide to come to their homes on days on which their families are visiting. Many patients inform the aides that “if you come on Tuesday, I will not let you in the house.” Therefore, there no service note would be present for Tuesday. CCME found claims inaccurate because the assessment stated services were needed 6 days a week, but the aide only provided services on 5 days. CCME never inquired as to the reason for the discrepancy. 3. CCME found every claim noncompliant because the files did not contain the service authorizations. Provider A had service authorizations for every client and could view the service authorizations on her computer queue. But, because the service authorization was not physically in the file, CCME found noncompliance. Oh, and here is the best part about #3…CCME was the entity that was authorizing the PCS (providing the service authorizations) and, then, subsequently, finding the claim noncompliant based on no service authorization. Because of Judge Croom’s Order, Provider A remains in business. Plus, she can retroactively bill all the unpaid claims over the course of the last year. Great job, Robert!!! Congratulations, Provider A!!! An acorn falls on Chicken Little’s head. His first immediate thought is, “The sky is falling. The sky is falling.” So Chicken Little begins his travels to tell the king that the sky is falling. Along the way he meets Cockey Lockey, Ducky Lucky, Drakey Lakey and Goosey Loosey, to name a few of his well-feathered friends. Each new waterfowl asks Chicken Little where he is going. To which Chicken Little replies, “The sky is falling. The sky is falling. We have to tell the king.” And the fowl join Chicken Little in his travel to the king. None of the characters question Chicken Little’s assertion that the sky is falling. They simply accept the fact that the sky is falling. All too often, people, like Cockey Lockey and Goosey Loosey, accept what they are told without questioning the source. • by an MCO that its network is closed. And some providers just accept the overpayment, the contract termination, the penalty, or the refusal to contract. Don’t be a Cockey Lockey! You do have rights! You deserve due process! Let’s talk about the possible penalties allowed by Medicaid regulations and your right to defend against such penalties and the procedural safeguards enacted to protect you. • Warning letters for those instances of abuse that can be satisfactorily settled by issuing a warning to cease the specific abuse. The letter will state that any further violations will result in administrative or legal action initiated by the Medicaid Agency. • Suspension of a provider from further participation in the Medicaid Program for a specified period of time, provided the appropriate findings have been made and provided that this action does not deprive recipients of access to reasonable service of adequate quality. • Termination of a provider from further participation in the Medicaid Program, provided the appropriate findings have been made and provided that this action does not deprive recipients of access to reasonable services of adequate quality. • Probation whereby a provider’s participation is closely monitored for a specified period of time not to exceed one year. At the termination of the probation period, the Medicaid Agency will conduct a follow-up review of the provider’s Medicaid practice to ensure compliance with the Medicaid rules. • establishing a monitoring program not to exceed one year whereby the provider must comply with pre-established conditions of participation to allow review and evaluation of his Medicaid practice, i.e., quality of care. All of this information is found in 10A NCAC 22F, et al, which is an administrative code. The code also defines provider fraud and abuse. The penalties enumerated above are penalties allowed for instances of provider abuse, but, only after proper investigation, proper notice to the provider, and proper consideration of lesser penalties. In other words, due process. Rule .0202 requires a preliminary investigation prior to a full investigation. Additionally, Rule .0302 requires the investigative unit to prepare a “Provider Summary Report,” furnishing the full investigative findings of fact, conclusions, and recommendations. Then the Department is to review the Provider Summary Report and make a “tentative” recommendation as to the penalty, and that tentative recommendation is reviewable under Rule .0400, which allows a reconsideration review. The provider will receive the results of the reconsideration review within 5 business days following the date of the review. If a provider is unhappy with the results of a reconsideration review, then the provider can appeal to the Office of Administrative Hearings (OAH) within 60 days. All of the above-mentioned administrative procedures exist in order to protect a provider from unfair, arbitrary, capricious, erroneous actions by DMA and any of its contracted entities. That means Public Consulting Group (PCG), Carolinas Center for Medical Excellence (CCME), all the MCOs, HMS, and any other state contractor must also follow these administrative procedures. So next time you are told that you owe hundreds of thousands of dollars to the state, that your Medicaid contract has been terminated, or your Medicaid reimbursements are being withheld, do not take these penalties at face value! Know you rights! Do not be a Cockey Lockey!! “Ring Around the Rosie.” What a fantastic children’s rhyme; it brings back nostalgic memories of my daughter being young. We would sing “Ring Around the Rosie,” while holding hands and running in a circle, and then fall as hard as possible (without hurting ourselves) onto the ground. We would just flop on the ground and my daughter loved it. Although many people believe that the rhyme describes the time during the Great Plague in England in 1665, which is pretty morbid, it is still a fun children’s game. But other than “Ring Around the Rosie,” it is no fun to run in circles until you get dizzy and fall to the ground. People usually just don’t spin around and around for fun. Sometimes going through a Medicaid or Medicare audit can feel like you are running around and around in circles and getting ready to fall. So too, can you feel this way if you are undergoing a prepayment review with the Carolinas Center for Medical Excellence (CCME). First, what is prepayment review? Prepayment review means that a contracted entity, in this case CCME, reviews your claims BEFORE you get paid for services rendered. While on prepayment review, you do not receive Medicaid reimbursements. This can continue for 12 months or unless you reach 70% accuracy for three consecutive months. 70% doesn’t sound too hard, right? But, what if the auditing entity runs you in circles, gets you dizzy and makes you fall to the floor? A client of mine owns a home health care company. She and her staff provide personal care services (PCS) to those who are eligible. For those who do not know what PCS is, it is basic caregiving services to help people with activities of daily living (ADLs), such as toileting, dressing, and eating. My client, we will call her Provider Nancy, was undergoing a prepayment review that had been conducted by The Carolinas Center for Medical Excellence (CCME). We won’t even talk about the fact that by the time Nancy came to me she had been on prepayment review for 17 months, but that the statute, NCGS 108C-7, only allows a provider to be on prepayment review for 12 months. When she was undergoing prepayment review, CCME gave her low accuracy rates for a number of reasons, some of which were so absurd, you will laugh out loud. For example, CCME denied claims because the service notes did not denote that the in-home aid put shoes on two of her clients. There were multiple dates of service (DOS) so these two clients contributed heavily to her low accuracy rating. I asked Nancy why the service note did not denote that her staff put shoes on her clients. She told me that these clients are double amputees. They do not have feet. So Nancy was dinged in her audit for not putting on shoes on someone without feet. Nancy’s story also highlights the confusion at CCME about its own prior authorization records for PCS. CCME repeatedly demanded a copy of the authorization for Nancy to provide PCS. If a provider like Nancy did not have a prior authorization, she would never have received payment in the first place. Nonetheless, CCME told Nancy to that she had not documented the prior authorizations. Oddly enough, in order to produce the authorizations she had obtained, Nancy had to contact CCME, because at the time of her prepayment review audit, CCME was the entity that reviewed independent assessments to determine prior authorization. 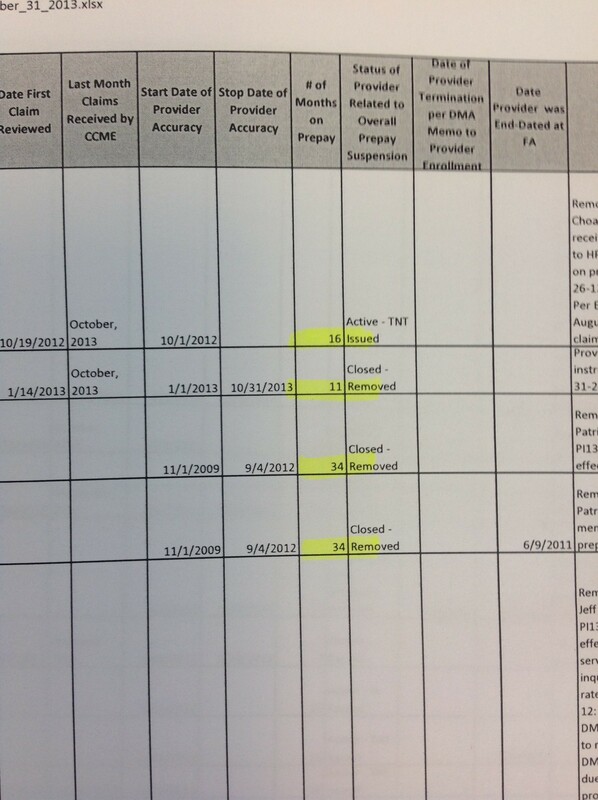 CCME was saying she had no prior authorization, but it was CCME who gave her the prior authorization!! How can a system operate like this, when an important reviewing entity does not know what is in its own records? It got worse: Nancy would then ask CCME for CCME’s prior authorization letter, but CCME could not or would not give her a copy. Then CCME reps attended the hearing and stated that Nancy was dinged for not having a prior authorization. Can a system get any more backward?? Sometimes Nancy’s service notes showed that her in-home aids did extra chores for her clients. Maybe an in-home aide would help a client ambulate because the client had sore muscles that particular day, but, according to the plan of care (POC), the client did not need hands-on assistance to ambulate. CCME would ding Nancy for the service note not being in compliance with the POC. Nancy was getting dinged in the prepayment review for doing MORE GOOD for her clients than what was required. It was not as if Nancy’s in-home aides were foregoing aid to the ADLs on the POC. Oh, no! The in-home aid was going over and above the call of duty for a client. And Nancy would get dinged. Needless to say, Nancy did not meet the 70% for three consecutive months in order to be removed from prepayment review. But, remember, Nancy was not paid for 17 months; she came to me 17 months into the prepayment review. She was hurting financially. Now, because of CCME’s confusing and inaccurate review, Nancy had little money and now had to hire a lawyer. Sure, we got her off prepayment review and got her paid, but she had to shell out thousands of dollars for attorneys’ fees. If you have to undergo “Ring Around the Rosie” during a prepayment review, I think that the auditing entity, in this case CCME, should have to pay for attorneys’ fees. Give some sort of disincentive for the auditing companies to be sloppy. A penalty. Now Liberty Mutual, not CCME, authorizes PCS.. But CCME continues to conduct prepayment reviews. CCME’s Prepayment Reviews Violate NCGS 108C-7!! Seriously!! A few months ago I sent a public records request to the Division of Medical Assistance (DMA). I eventually received the information…today. The law specifically states that you cannot be forced to endure prepayment review for over 12 months. One of the documents that DMA sent me is a chart with every single provider that had been placed on prepayment review. The chart includes the number of months that the provider was on prepayment review. But, remember, 12 months is the max per law. See the highlighted numbers? 16. 11. 34. 34. 7. Three of the numbers are above 12….which means, three of the 6 on the first page violate state statute. How many prepayment reviews were unlawfully conducted? (As in, DMA/CCME kept the provider on prepayment review beyond 12 months)? Reagrdless…well over half the prepayment reviews violates 108C-7!!! That same Draconian law that DHHS holds each provider to…DHHS (via CCME) is ignoring the plain language of the statute. One poor provider was on prepayment review 46 months!!!! Another 45! A bunch of the providers were in the 30s! Why didn’t these providers protest at being on prepayment review for so long? I have a couple of theories: (1) They are out of business; (2) They had no lawyer and had no idea that there was a 12 month limit. Well, readers, now you know…There is a 12 month limit to prepayment review!! But DHHS/DMA/CCME is not following it. Seriously!! NC Medicaid Providers, Are You Required to Seek an Informal Appeal Prior to Filing a Contested Case at OAH? 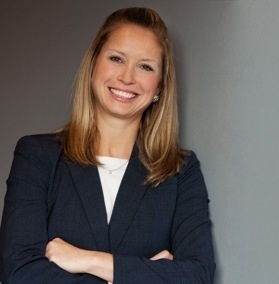 Recently, numerous clients have come to me asking whether they have the right to appeal straight to the Office of Administrative Appeals or whether they have to attend informal appeals first, whether the informal appeal is within a managed care organization (MCO), the Division of Medical Assistance (DMA) or any other entity contracted by DMA. The answer is: No, you are not required to go through the informal review prior to filing a contested case at OAH, but, in some cases, the informal review is beneficial. “Any dispute between an agency and another person”…Obviously DMA is a state agency, but is Public Consulting Group (PCG)? Is the Carolinas Center for Medical Excellence (CCME)? East Carolina Behavioral Health? HMS? What if you disagree with a prepayment review result that CCME conducted? DMA had nothing to do with the actual prepayment review. Can you bring a contested case at OAH against CCME? Yes. But include DHHS, DMA as a named Respondent. If you include the state agency that contracted with the entity, then jurisdiction is proper at OAH. The argument being that the actions of a contracted entity is imputed to the principle (DMA). “Should be settled through informal procedures…” Notice it states “should,” not “must.” Time and time again when a provider skips the informal review within the entity (for example, let’s say that MeckLINK terminates Provider Jane’s Medicaid contract and files a grievance with OAH instead of through MeckLINK first) the counsel for the entity (MeckLINK in this example) argues that OAH does not have jurisdiction because Jane failed to exhaust her administrative remedies. As in, Jane should have appealed through MeckLINK first. In my opinion, appealing to the very entity that is causing the grievance is futile. The decision was made. The entity is not going to rule against itself. Plus, there is no requirement for any petitioner to exhaust informal appeals prior to appealing to OAH. When you receive a Tentative Notice of Overpayment from PCG, you can go to an informal review or you can appeal in OAH. The “failing to exhaust administrative remedies” argument is being misapplied by the entities. In order to file judicial review in Superior Court or a declaratory judgment action in Superior Court, you must exhaust all administrative remedies prior to seeking relief in Superior Court. But the requirement to exhaust administrative remedies is not applicable to filing at OAH. The upshot is that any person aggrieved may bring a contested case in OAH without attending an informal appeal first. However, there are some occasions that, in my opinion, the informal appeal is useful. Such as an overpayment found by PCG. If you receive a Tentative Notice of Overpayment by PCG, the informal reconsideration review at DMA can be helpful for a number of reasons. 1. It forces you to review the audited documents with a fine tooth comb prior to getting in front of a judge. 2. It allows you to find all PCG’s mistakes, and there will be mistakes, and bring those mistakes to the attention of the auditor. 3. It gives you a chance to decrease the alleged amount owed before a contested case. Keeping those positive aspects in mind, most likely, the reconsideration review will NOT resolve the case. Although it has happened occasionally, more times than not, you will not agree with the reduced amount the DHHS hearing officer decides. The alleged overpayment will still be extrapolated. The alleged overpayment will still be ridiculous. Other than an overpayment, I have found very little use for the informal appeals. Our government is made of checks and balances. The reason for having checks and balances is to create independent governing bodies with separate powers, thereby preventing any one branch from having more power over another. The legislative branch (General Assembly), most importantly, passes bills (makes the laws) and has broad taxing and spending power. The executive branch (Governor), most importantly, makes appointments, may veto bills, but those vetoes may be overridden, and executes the spending allowed by the legislature. The judicial branch (court system), most importantly, interprets the laws passed by the legislature, exercises injunctions and judicial reviews. How these checks and balances can play out in real life are endless. But, without question, if the legislative branch fails to check the executive branch, even if the judicial branch is checking the executive branch, then the executive branch exceeds its power and the legislative branch is failing its intended job. It has nothing to do with Republicans versus Democrats. No one cares that the executive branch is conservative or liberal or whether the legislative branch is 60% Republicans or 70% Democrats. It is a matter of the legislative branch doing its job. The legislative branch’s job is to check and balance the executive and judicial branch. Here, in North Carolina, it appears that the legislative branch is not checking the executive branch. (While all our branches of government have their own shortcomings, I am concentrating on the legislative branch in today’s blog because, recently, I have seen other legislative branches step-up. Now our state legislative branch needs to step-up.) It certainly appears that our judicial branch is providing the checks and balances on the executive branch via the Office of Administrative Hearings (OAH). But where is the legislative branch’s checks and balances? If our legislators do not demand accountability, who will? 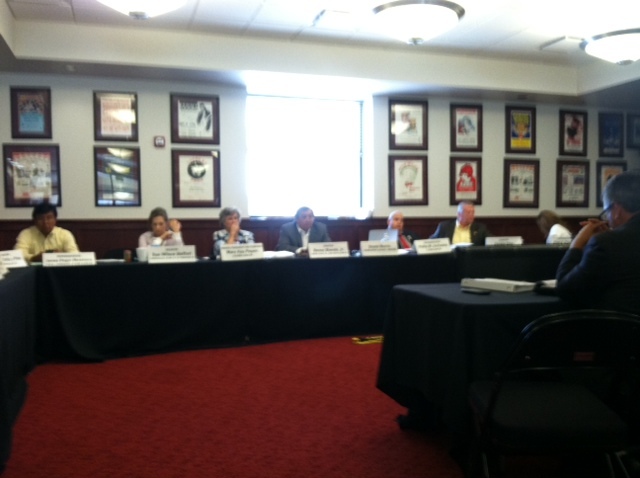 To see my blog explaining the events in NM leading up to the NM subcommittee meeting, click here. To see my blog explaining the events in Mecklenburg county leading to the commissioner’s meeting, see all posts on my blog. Or if you don’t have time to read all posts in my blog over the past 9-10 months, click here. So why hasn’t the NC General Assembly held a meeting to demand accountability from all MCOs, PCG, and the Department of Health and Human Services (DHHS), Division of Medical Assistance (DMA)? Because of our government’s system of checks and balances, the legislative branch has the power over the money, both the taxing and spending power. So the legislative branch has the authority to have DHHS appear before the General Assembly or a subcommittee and demand accountability for the tax dollars spent…as to all DHHS’ contracted companies…and DHHS’ apparent lack of supervision over these contracted companies. Other legislative entities have done this. As I already said, last week, the New Mexico behavioral health subcommittee convened to hold HSD (NM’s DHHS) and PCG accountable. (1) Larry Heyek, the HSD Deputy General Counsel (remember, HSD = North Carolina’s DMA), Brent Earnest, Deputy Secretary HSD (representing Secretary Sidonie Squier, who was unable to attend due to eye surgery), and Diana McWilliams, Chief Executive Officer, Interagency Behavioral Health Purchasing Collaborative; Director, Behavioral Health Services Division, HSD. (2) Me…to be joined later by Thomas Aldrich, manager at PCG. (3) William Boyd Kleefisch, F.A.C.H.E., Executive Director, HealthInsight New Mexico, Margaret A. White, R.N., B.S.N., M.S.H.A., Director, External Quality Review, HealthInsight New Mexico, and Greg Lújan, L.I.S.W., Project Manager, Behavioral Health, HealthInsight New Mexico. The above-listed people all testified before the NM behavioral health subcommittee because the subcommittee demanded accountability from HSD, PCG and others due to the disastrous state of mental health in NM. Why hasn’t the North Carolina legislature demanded the same accountability? 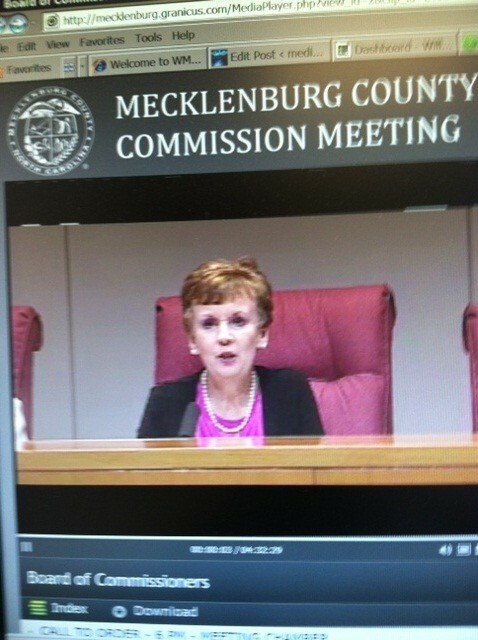 Similarly, September 3, 2013, the Mecklenburg county commissioners held a meeting and demanded accountability of MeckLINK. Apparently, behavioral health care providers have been complaining to their county commissioners about MeckLINK denying medically necessary services and targeting certain providers. So, when NM providers complained to their State legislators, the NM subcommittee for behavioral health held a meeting to investigate the source of these complaints. When Mecklenburg county providers complained to their county commissioners, the County commissioners held a meeting to investigate the source of these complaints. Have not enough providers complained about PCG and the actions of the MCOs to our North Carolina legislature? I find that hard to believe, but, just in case, providers….CONTACT YOUR STATE SENATOR AND REPRESENTATIVE! There is NOT statewide consistency with the MCOs. Where 1 MCO denies services, another will authorize. Where 1 MCO terminates a Medicaid contract of a provider, another does not. Where 1 MCO finds a provider compliant, another does not. The DMA Clinical Policies and Innovations Waiver are not being applied consistently across the state. Because of these inconsistencies, the MCOs have created 11 Medicaid jurisdictions. Where is the single state entity? The MCOs are terminating provider contracts in violation of federal law. Federal Medicaid law dictates that a “single state entity” manage Medicaid. In NC, that single state entity is DHHS, DMA. Yes, DMA may contract with companies. Yes, DMA may delegate some duties to contracted entities. BUT, DMA cannot allow a contracted entity substitute its judgment for DMA’s judgment. See K.C. v. Shipman. See also my blog: NC Medicaid: One Head Chef in the Kitchen Is Enough! If DHHS is allowing 11 different companies to decide (use its own judgment) as to whether a provider can provide Medicaid services, the MCOs are substituting their decision-making in place of DHHS. Also, at times, the MCOs are terminating the providers based on erroneous audits from the Carolinas Center of Medical Excellence. For more on that…click here. The MCOs are denying Medicaid recipients medically necessary mental health services. The MCOs are prepaid, risk-based models. What does that mean? That the MCOs have monetary incentives to DENY services in lieu of cheaper services. In an extreme case, one MCO has denied 100% of ACTT services (24-hour, 7/days/week mental health care) in lieu of weekly, one-hour sessions of therapy. Really? 24-hour care…reduced to weekly therapy???? But authorizing weekly therapy instead of 24-hour care saves the MCO thousands, if not hundreds of thousands. What happens to the Medicaid recipients denied medically necessary services? Answer: Imprisonment and hospitalizations. So, fret not, taxpayers, you are actually paying MORE in taxes when the MCOs deny medically necessary services. The increase in tax expenditure just will not be funded by the MCO’s Medicaid money. As an aside, the attorney for the MCO stated that the Medicaid recipients should be the ones to appeal these erroneous denials. To which I say, “Ha!” One denied recipient suffered auditory and visual hallucinations (birds, snakes and crocodiles attacking.) Another attacked his mother with a knife after services were denied. Another was evicted from her home and, subsequently, jailed. Another believed Satan spoke to him, telling him to kill himself. I ask, when should the Medicaid recipients have (a) gotten themselves to a computer; (b) googled the NC Office of Administrative Hearings (OAH); (c) found the form to appeal a Medicaid denial of services; (d) filled-out the legal reasons they disagree with the denial of services; (d) complied with OAH procedure and drafted a prehearing statement, conducted any necessary discovery, and created all legal arguments to demonstrate medical necessity; and (e) attended a hearing in front of a judge…before or after hospitalization? Before or after the recipient has had his/her conversation with Satan? PCG’s audits are NOT 95% accurate (not even close). I’ve heard that PCG’s contract with DHHS places an obligation on PCG that its audits be 95% accurate. One person questioned whether that was 95% accurate as to PCG must be able to recoup (defend upon appeal) 95% of the audit results. Obviously, that is not the case, because the inverse is probably closer to true. 95% of PCG’s audits are overturned (obviously, this number is not accurate…I am making a point). Another person wondered whether the 95% accuracy meant that if 1 PCG auditor comes up with a $1 million overpayment, and the next day another PCG auditor audits the same documentation, that the 2nd auditor would be within 95% accurate of the $1 million the 1st auditor deemed needed to be recouped. If the latter is the case, I can see why PCG may have 95% accuracy. If you teach all your staff how to audit a Medicaid provider and all staff are taught to audit incorrectly, then, no matter the staff member auditing, the audit will be incorrect…but consistent. Regardless, for a multitude of reasons, I have found almost all PCG audits erroneous. Yet, these PCG audits are terrifying Medicaid providers, causing them to ramp up attorney fees to defend themselves, and, in some cases, putting providers out of business. And, in all cases, increasing the provider’s administrative burden and decreasing the time a provider can allot to serving the Medicaid recipients. Contact your state legislators! Help our General Assembly provide the checks and balances needed! Just to help out, here is a link to all NC State Senators’ telephone numbers. Because, in the absence of the legislative branch properly checking and balancing the executive branch, the legislative branch loses power and the executive branch gains power. NC Taxpayers Demand Accountability as to Behavioral Health Care Medicaid Funds (And That Medicaid Recipients Reap the Benefit of Such Funds). I ask you, why do employees of an MCO receive better health care plans with Medicaid dollars than a Medicaid recipient with Medicaid dollars? The State of North Carolina is accountable to me, and every taxpaying citizen, for taxes spent. Similarly, executives of a corporation owe a duty to shareholders to account for stock crashing. Remember Enron? What a disaster! Enron has been dubbed the biggest audit failure. Enron shareholders filed a $40 billion law suit after the company’s stock price, which achieved a high of US$38.44 per share in mid-2000, plummeted to less than $1 by the end of November 2001. And why did the shareholders sue? Because they lost money? Well, yes, but it is much more. The reason the shareholders lost money is because the executives of Enron owed a duty to the shareholders, basically, to be accountable to report correct data on financials. Apparently, Enron’s financial statements were complex and confusing to shareholders. It has been said that from 1997 until its demise, “the primary motivations for Enron’s accounting and financial transactions seem to have been to keep reported income and reported cash flow up, asset values inflated, and liabilities off the books.” Bodurtha, James N., Jr. (Spring 2003). “Unfair Values” – Enron’s Shell Game. Washington, D.C.: McDonough School of Business. p. 2. CiteSeerX: 10.1.1.126.7560. Arthur Anderson was the audit and accounting firm, which also went belly up due to Enron. But Enron’s financials were false and, ultimately, led to numerous convictions. Now, I am certainly NOT comparing the State of North Carolina to Enron. I am merely providing an example of a possible result when accountability is ignored. When the fiduciary duty owed is not fulfilled. Not completely unlike corporate financials, North Carolina creates a budget every fiscal year (yeah, I get it, not completely similar either). When the Medicaid budget is created each year, which is more than $18 billion, I, as a taxpayer, expect those Medicaid dollars allocated to the Medicaid budget to be spent for the benefit of Medicaid recipients. Medicaid money should be spent on Medicaid providers, who service Medicaid recipients. I expect that administration costs be kept at a minimum. I expect that Medicaid providers receive timely, prompt payments, and I expect that Medicaid recipients receive good, quality, and continuing health care. I do not expect the State to cover the health care for everyone. Not even most people. I understand that funds are not limitless in government and that there must be limitations on spending, otherwise our great State will become another Detroit. However, I do expect that the funds that ARE allocated to Medicaid to BE allocated for the benefit of the Medicaid recipients. Period. In the past year, we have implemented the Managed Care Organizations (MCOs) to manage Medicaid behavioral health care. In theory, the MCOs were implemented to cut down the administrative costs for DHHS. Basically…outsourcing. In theory, it sounds good. DHHS’ administration costs are out-of-control. After the January 2013 Performance Audit on DHHS, State Auditor Beth Wood said North Carolina’s administrative costs are 38 percent higher than the average of nine states because of “structural flaws” in how DHHS operates the Medicaid program. So, in response to these high administrative costs (among other things), we took the administration of behavioral health from DHHS and delegated that administration to the MCOs. With the number of employees in Health and Human Services over 17,000 employees and the average MCO employing only a couple hundred, it seems, on its face, to be a good idea. Surely these MCOs can and will run more efficiently that the government! Right? (The other assumption in outsourcing is that DHHS administrative costs would actually decrease due to the MCOs, but I have seen no indication of this). I have seen no indication of the “structural flaws” in how DHHS operates the Medicaid program being fixed. According to the website indeed.com, the average salary for a person working at NC DHHS is $47,000. In addition to the average salary, you also need to contemplate that employees of NC DHHS qualify for basic health benefits at no cost. However, if a DHHS employee wants to have his or her spouse covered or an insurance plan above the “basic plan,” there is a nominal cost. (The standard plan (above a basic plan) for an employee is still low, only $22.76/mo). Health insurance premiums are a HUGE expense. So when calculating salaries, if an employee receives free health care, in essence, the salary is higher…due to not having to pay premiums every month. Health care premiums add up. For example, I pay $750.00 monthly for health insurance for me and my husband. That’s $9000/year! Yikes!! (No, for real, yikes!!) If Williams Mullen paid my health insurance premium, in essence, my salary would increase by $9000/year. Including health care and trying to underestimate instead of overestimate, I calculate the average salary, including health care premiums, at NC DHHS at about $52,000-ish. Since the MCOs went “live,” the Medicaid tax dollars that would have been held by NC DHHS, are now divvied up and bestowed upon each MCO. Today, we have 11 MCOs, but soon Smokey Mountain Center will take over Western Highlands, bringing us to 10 MCOs. 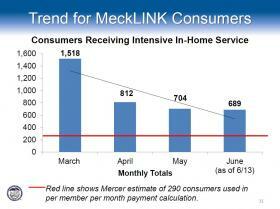 Plus, according to a recent article published, “Frustrations With MeckLINK Grow as Denials for Care Increases,” MeckLINK is financially unstable. We may soon be down to 9. But, as for now, 11 MCOs receive the federal and state tax dollars for Medicaid behavioral health. CenterPoint Human Services (CenterPoint), one of the MCOs, staffs approximately 200 employees (about 19 part-time). Out of the 200-ish employees, 41 employees receive salaries over $75,000 (including health care). Almost 1/4 of CenterPoint’s employees have salaries OVER $75,000. 145 employees receive salaries over the NC DHHS average salary: $52,000. Let’s talk about the price of health care. Remember, these are OUR tax dollars. Employee A has a base salary of $45,500. But A received $16,965 in medical contribution. Remember, my insurance for me and my husband costs $9,000/year. For $16,965, how big of a family are we taxpayers covering? Employee B has a base salary of $43,500. (Now, let me preface this example with…I hope…I pray…that this one example is a typo on CenterPoint’s financials, because, if not, this is outrageous!). According to CenterPoint’s financials, Employee B gets $84,658 in medical contributions. Including FICA contribution, dental, short and long-term disability, 401K, etc., Employee B receives $136,716 in total compensation. Admittedly, I have no way to confirm whether this is a typo….and, I must admit, I really hope it is. Regardless, according to CenterPoint’s financials Employee B receives $84,658 in medical contributions for a total of $136,716 total compensation, but with a base pay of only $43,500. The number $12,007 is popular. 12 employees in total receive $12,007 in medical contributions for a total of $144,084 (for 12 employees). 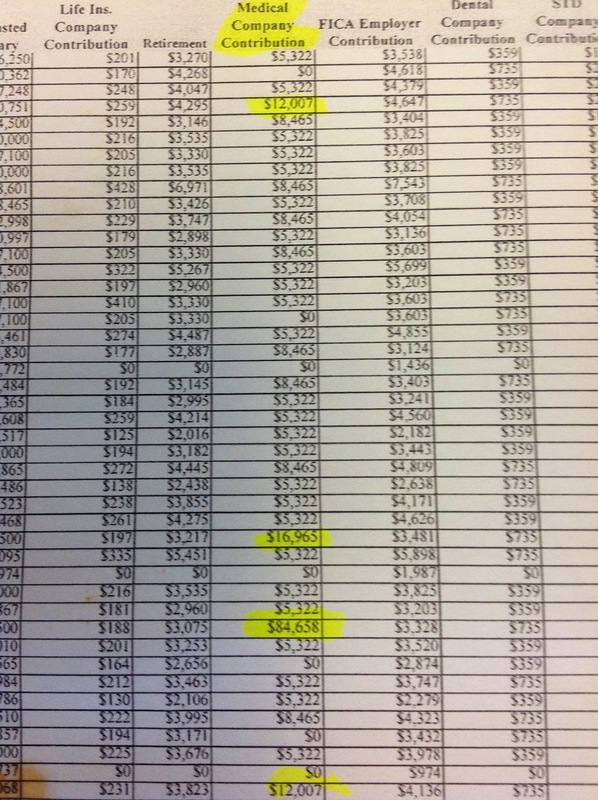 Another employee gets $16,965 in medical contribution with a base salary of $47,100. Now let’s talk about the Medicaid recipients’ behavioral health care services. Since the MCOs went live, it is indisputable that less behavioral health services are being authorized by the MCOs. (Why the government has not addressed this tragedy, I do not know). Another question is how many less behavioral health care servies? I have my suspicions that if we were shown the number of behavioral health care services authorized last year compared to this year, the line would look like \. Remember the chart from yesterday? And this chart only shows one county. One MCO. NC DHHS is handing over millions (just the behavioral health portion of the Medicaid funds) of Medicaid dollars to the MCOs. But the money is not going to service Medicaid recipients. The Medicaid dollars are paying salaries at every MCO, as well as the employees’ families’ health insurance plans. What Medicaid funds go to the recipients for medically necessary services? Seems to decrease every day. Aren’t Medicaid funds supposed to be for Medicaid recipients? Going back to the State of North Carolina’s accountability to me and all taxpayers as to Medicaid tax dollars spent, I have not seen any investigation as where the behavioral health care Medicaid money is being spent. The same article from above stated something that made me extremely concerned. In “Frustrations With MeckLINK Grow as Denials for Care Increases,” the article cites that “[o]nce MCOs took over, North Carolina stopped tracking what care patients are receiving. A health official said the database goes blank. That means the state does not know how many North Carolinians received services, what those services were, or what was denied. It can compare MCOs financials, but not their care.” (emphasis added). Are you kidding me? The State of North Carolina, which is accountable to me and all taxpayers, cannot determine whether the Medicaid dollars being handed over to the MCOs are being used appropriately???? Yet 145 employees at CenterPoint receive salaries over the NC DHHS average salary: $52,000! 145 out of 200-ish, to be exact. Some employees are receiving health insurance contributions of over $10,000/year…and NC cannot determine how many Medicaid recipients received medically necessary behavioral health care?? As a taxpayer, I am appalled. And I want accountability!! Where is the fiduciary duty to taxpayers?